E: Electrical toys. "These toys can cause electrical shocks or burns," says Dr. Brown. "Opt for battery-powered toys." L: Loud noises. "Some toys will be 'intended for outdoor use only,'" she notes. This is secret code that means this toy is REALLY LOUD. For kids, prolonged exposure to sounds at 85 decibels or higher can cause hearing damage. Several toys exceed 100 decibels when they are measured at close range. F: Flying objects. "These items may accidentally fly into a child's eye or head and cause injury," warns Dr. Brown. S: Sharp edges. "Poorly made toys may have hard pieces of plastic or pins that stick out, which can cause cuts and abrasions," she says. T: Tiny parts. "Young children will swallow small toy pieces, creating a choking hazard," notes Dr. Brown. "A good rule to follow: If the toy is smaller than the diameter of a toilet paper roll, it is too small to be in your toddler's house." E: Emotional hazards. "Violent videos or games can have a significant emotional impact on your child," cautions Dr. Brown. "Snow White's evil stepmother can be pretty darn scary to a toddler." W: Wrong toy for the age of the child. Even if your child is a prodigy, it's a good idea to follow the intended-age use for a product. 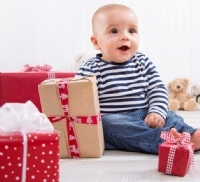 To help take the guesswork out of your shopping experience, we zero in on some of the newest offerings to put under the tree that will have your baby smiling all year long. Manhattan Toy Baby Stella Bringing Home Baby Set (12 months and up): She'll always be your little baby, but it's only natural that before long, she'll want to play mommy, too. This soft doll play set includes all the newborn baby essentials to get her started, including pretend diaper cream, two diapers, magnetic pacifier, magic milk bottle, bib, hat, birth certificate and swaddling blanket. www.manhattantoy.com. Skip Hop Fold & Play Book (12 months and up): This origami-inspired toy is a book and learning game in one. One side of this wooden book features a numbers game, while the other helps budding toddlers learn new words, with the help of some colorful jungle friends. www.skiphop.com. Green Toys Shape Sorter (6 months and up): Once your baby learns to sit up and is ready to begin understanding how the world works, she'll be ready to check out this eco-friendly shape sorter made from recycled milk jugs. As she figures out which of the colorful objects fit into their corresponding holes, she'll develop her fine-motor skills, hand-eye coordination and problem-solving skills. www.greentoys.com. B kids ABC Touch Pad (6 months and up): He may not be ready for his first iPad just yet, but this interactive lights and sounds toy will put him on the right track. Multiple game modes introduce tots to their ABCs, 1-2-3s, colors and shapes in different formats, including music. www.bkidsfun.com. BeginAgain Nubbles (6 months and up): These tactile toys are as fun to say as they are to play with. Made from dishwasher-safe natural rubber, these textured balls encourage grasping as they strengthen fine-motor skills and also work great in the bathtub. www.beginagaintoys.com. Tiny Love Flexi Play (Newborn-18 months): This portable play gym can accommodate all stages of your baby's development. Contrasting patterns, a mirror and crinkly toys offer plenty of stimulation during tummy time for younger babies, while twisting and shaping this flexible toy into a tunnel or bridge encourages budding toddlers to crawl and explore. www.tinylove.com. VTech Roll & Learn Activity Suitcase (12 months and up): Babies can set out on a learning adventure with this interactive suitcase that puts fun on the run. An activity panel features four light-up piano keys, a removable phone, spinning gears and more to delight and amuse curious kids. More than 30 melodies and sing-along songs will entertain as they open and pack up this entertaining tote. www.vtechkids.com.